LED lights have failed when their light output reaches 70% of the original output. This is commonly referred to as L70, because the light output is measured in lumens. The industry standard L70 operating life of an LED light is 50,000 hours. More simply, after 50,000 hours the LED light will have 70% of its original brightness. 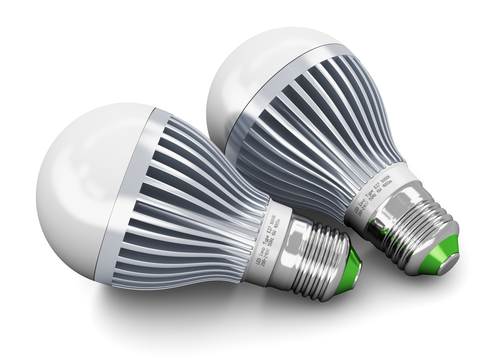 Unlike traditional lighting sources, LED bulbs do not go dark when they fail. Instead, they become increasingly dimmer over time. While LED lights continue to work past the L70 rating, this is the point where most end users consider an LED replacement. Just because an LED bulb is rated L70 do not assume it will last for 50,000 hours. While there are many different factors reducing LED life, ambient temperature and power supply are two of the most important. The best environments for maximizing LED life have ambient temperatures between 68°F and 77°F. While this range is ideal, many LED products are rated for higher and lower temperatures. As a result, it is critically important property managers discuss all environmental conditions with their lighting contractor during the bid process. All light bulbs come with a power rating, which typically range from 60 watts to 100 watts for interior bulbs. Putting a 60 watt LED bulb in a fixture that generates 100 watts will overload the LED’s circuits sooner rather than later. Consequently, this will shorten the lifespan of LED’s at your property. While LED retrofit costs have decreased significantly, it is still a major green investment for most properties. As a result, eliminating factors that reduce LED life is critically important. Consequently, property managers should review these factors with prospective lighting contractors before moving forward with a retrofit. At the same time, property managers replacing bulbs in-house, should review these factors reducing LED life with their maintenance teams. This is especially important at properties with older fixtures. Need help finding a local LED lighting contractor? The BidSource team at Property Manager Insider will find a qualified local contractor for your next project! Just tell us about your LED project using the form below and our team will be in touch with a great professional lighting contractor looking to do more work with property managers!